Here we see a story about the Iranian prince Gushtasp, who slays a dragon with a sword and dagger. The painter has skillfully used color, shape, and composition to heighten the drama of the encounter and accentuate the contrast between beast and man. The curling dragon, which looks Chinese in style, stands on pink rock that mirrors its body shape in its rounded formations. 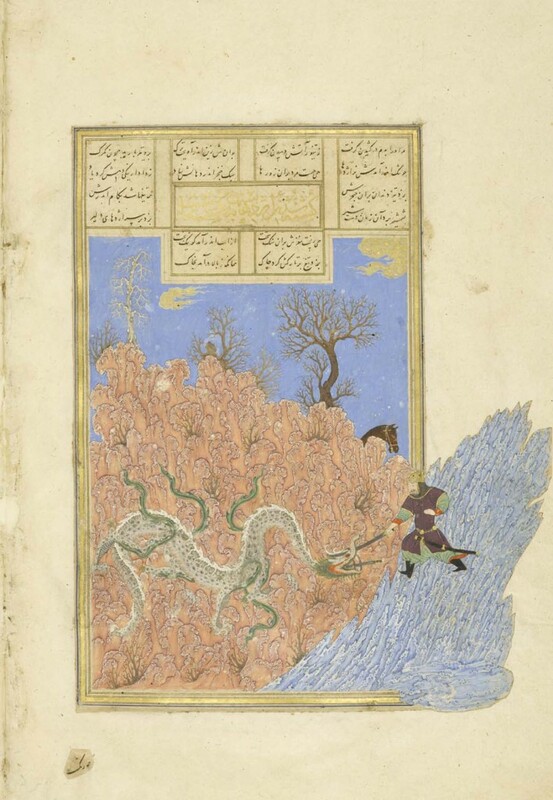 Rustam, on the other hand, braces himself against an outcropping of sharp blue stone as he thrusts his steely weapons into the dragon’s mouth. The action spills out into the margin, and Gushtasp is pushed nearly out of the frame entirely. He straddles the frame with determination, though, and will soon fight his way forward and force the dragon to succumb. His horse can be seen waiting in the background.